The aesthetics work really well, actually. 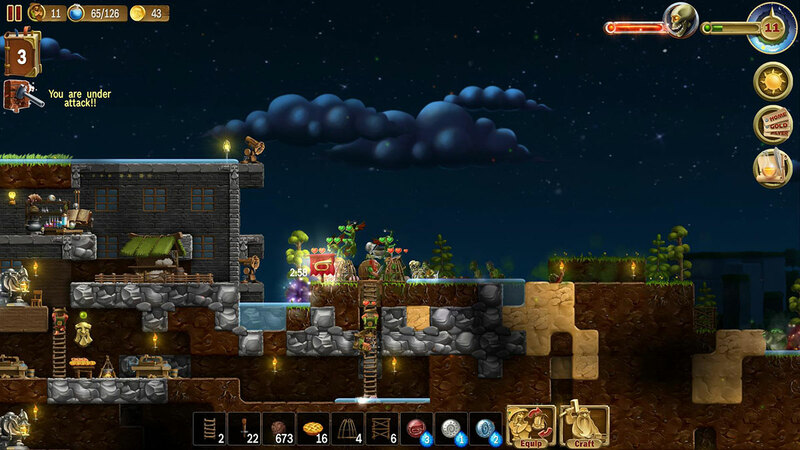 Craft the World is a game billed as “a unique sandbox strategy game, the mix of Dungeon Keeper, Terraria and Dwarf Fortress.” What initially attracted me to the game was the comparison to Dwarf Fortress, which is one of those mythical games that someone you know spent 6000 hours playing, but you didn’t even bother looking at after seeing the screenshots. I am led to believe there are texture packs for Dwarf Fortress, but considering I can’t even bring myself to play FF12 due to graphics alone, I figure I’ll wait until some fan recreates the entire thing in an actual watchable format. In the meantime… well, Craft the World. Right now the game still feels like it’s in beta. I am playing in the “Campaign” mode, which I understand to be an extended tutorial. The problem is that I have no idea how to “beat” the campaign. There’s a 40-60 minute timer which dictates when a monster portal opens, and I have been defeating said monters each time they appear. I think I read something about defeating a boss, who will then drop the portal for the next campaign world. Or something about completing all the “tech trees” to unlock it. Or something. The actual gameplay is both interesting and somewhat vapid. Instead of controlling an actual character, you are the disembodied cursor simply marking which squares you want dug/built/collected/attacked. If a dwarf is available and feels like it, he will go over and start working the squares. So the gameplay cadence is queuing up a lot of work, spending time in the crafting menu, and then watching your dwarves (hopefully) carry it out. Resources are only collected two items at a time, and said items are only actually available once the dwarf makes it back to your Stash. So the end result for me was usually watching the dwarves go about their business, eyes glazed, and then realize 5 minutes later that they were all standing around idle. Technically, you can control a dwarf directly at any time if you want to get more hands-on. In fact, you pretty much have to to get any sort of reasonable construction project going. Not only do you have an increased object placement range (uncontrolled dwarves can only reach 2 squares instead of 3), but your controlled dwarf has full access to your entire inventory. Otherwise, yep, the dwarves have to carry over the supplies two items at a time; not a whole lot of fun when you’re trying to get them to build a ladder down a mineshaft. As I mentioned in the beginning though, the game feels Beta-ish. The controls have clearly been designed around an eventual tablet version, as hotkeys are limited and damn near everything revolves around left-click. There are quests/tasks in the Campaign mode which are either broke, or frustratingly vague. For example, one quest was to start a farm by planting Wheat. I actually had some Wheat, but nothing I did seemed to work in terms of getting it planted. Then I thought perhaps I needed “Grain” first, e.g. seeds, but no amount of Wild Wheat harvesting produced any. And, you know, the quest clearly says to plant Wheat, not Grain. I eventually completed the quest after collecting enough Wild Wheat, which shouldn’t have worked based on the description, but whatever. In the meantime, I’m willing to give it a little bit more time to get more interesting. I can’t help but feel like there is something there, some nugget of fun waiting to be uncovered. At the same time, I also kinda feel like the devs missed everything that was actually fun about the games they were inspired by. Terraria this ain’t, that’s for damn sure. Posted on August 3, 2015, in Impressions and tagged Blaugust, Craft the World, Impressions, Tablet Port, Terraria. Bookmark the permalink. 2 Comments. Other than Minecraft and Terraria, similarly sandbox-like crafting games just don’t do it for me. i can’t even get into Starbound. I’ve owned Starbound for a long time now, but I’m still holding off until it actually “releases.” Are they still doing beta wipes? It’s just too risky IMO, especially when they add in new biomes and other things that radically change the possible flow of the game.